At least seven people died after clashes between security forces and worshippers in a religious ceremony marking Epiphany in northern Ethiopia over the weekend, officials said. Authorities in the Horn of Africa country’s Amhara region said they were yet to determine the causes of the violence that first erupted on Saturday in Woldiya, more than 500 kilometres north of Addis Ababa. “Attempts to open roads and prevent destruction of property are still ongoing. The situation has improved since Sunday but we still have to undertake such measures,” said Amare Goshu, a police commissioner of the district. A security forces member deployed to quell the violence was among the dead, he said. Orthodox Christians use Epiphany celebrations to mark the baptism of Jesus Christ. It was not immediately clear if the violence is related to unrest that plagued the country in 2015 and 2016. In Ethiopia’s central Oromiya province, hundreds were killed over that period in violence triggered by allegations of land grabs, with protests widening into demonstrations over political restrictions and perceived rights abuses. Protests previously took place in the Amhara region, with dozens dying in violence sparked by a territorial dispute. Ethiopia is a Western ally against Islamist militants in neighbouring Somalia and an economic power seen as a centre of relative stability in a fragile region. 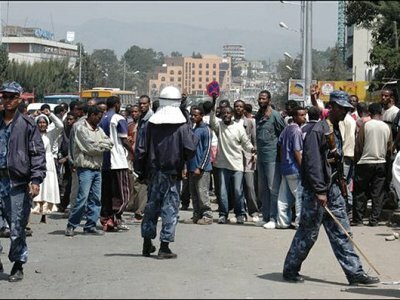 Government in Addis Ababa sought to calm political turmoil by announcing reforms and releasing dissidents. Last week, a senior opposition leader jailed for collusion with anti-government rebel groups was freed alongside 114 other inmates.